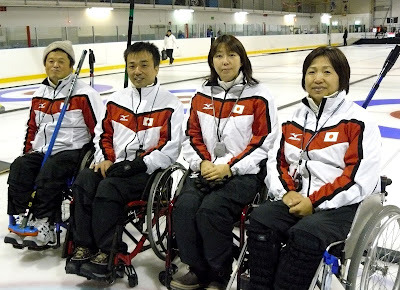 I am now told Japan's National Wheelchair Curling Championships have been cancelled because of the devastation caused by this week's earthquake. Original post: Japan's National Wheelchair Curling Championships had been scheduled for next weekend in Ninohe, Iwate - one of the areas most devastated by yesterday's earthquake. Yayoi Mashimo, a friend who lives in Tokyo and had intended to travel north with a photographer to watch the championship, tells me that she is sure the event will have to be re-scheduled if not cancelled. She has been in contact with the Japanese Wheelchair Curling Association and they are trying to gather information. Apparently the damage is so severe in the north that it is hard to gauge what is happening. Our best wishes go out to Yoji Nakajima, Takashi Hidai, Katsuo Ichikawa, Ayako Saitoh and coach Katsuji Uchibori who played in Vancouver a year ago, and Kazuyuki Mochiki, Aki Ogawa and Teruo Moriizumi who competed in the 2010 Qualifying Tournament in Finland last November. We hope they are safe and able to regroup in time for next season's Worlds Qulifying. Canada's sledge hockey team began an international invitational tournament yesterday in Nagano, a central mountain area, but play was halted. It may resume on Sunday.